Digger by Ursula Vernon » Archive » Quick Plug! 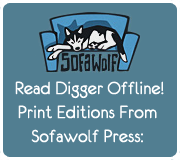 It is almost completely and totally unlike Digger in any way, but that can be said of most comics, so go check it out! Hoping there’s more to the characters than I can currently see, but I like the main(?) character’s snark. But like just about everything else on the planet, it is distinctly Not Digger.